Live Cinema And Its Techniques. 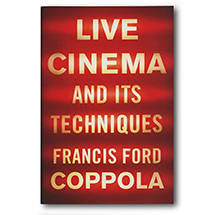 From one of the masters of twentieth-century cinema, an indispensable and entertaining guide to a visionary new form of moviemaking that can be appreciated by the avid film buff and general movie lover alike. Featuring chapters on: A Short History of Film and Television; The Actors, Acting, and Rehearsal; The Question of Style in the Cinema; Obstacles and Other Thoughts on Live Cinema No Matter What They May Be; Equipment: Now and in the Near Future.